It is a small miracle that I am able to design in 3D on my 2008 Macbook. 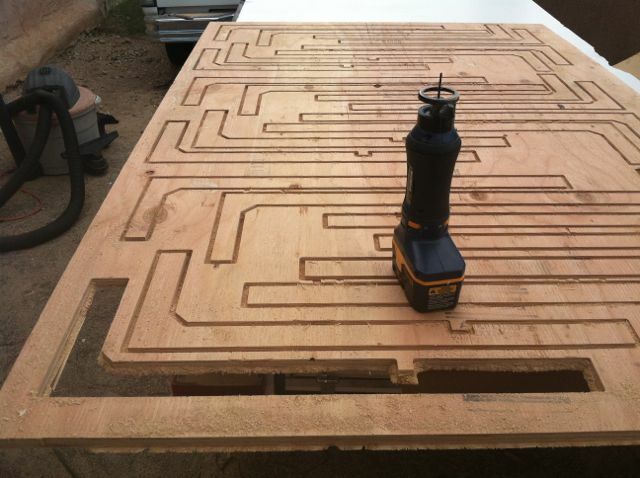 I use a program called Sketchup Pro, which will export images in a program language called .dwg – from which the computer controlled router at CNCRoutingAZ in Chandler will do its thing on a sheet of exterior-grade 3/4 inch plywood. 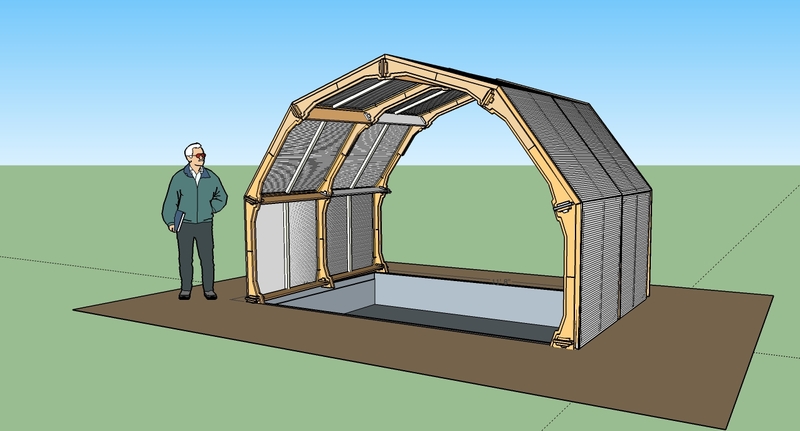 It took me about 40 hours of intense work the past two weeks to get the designs for both the Entry Arch and the Full Arch with 37″ sidewalls ready for production. 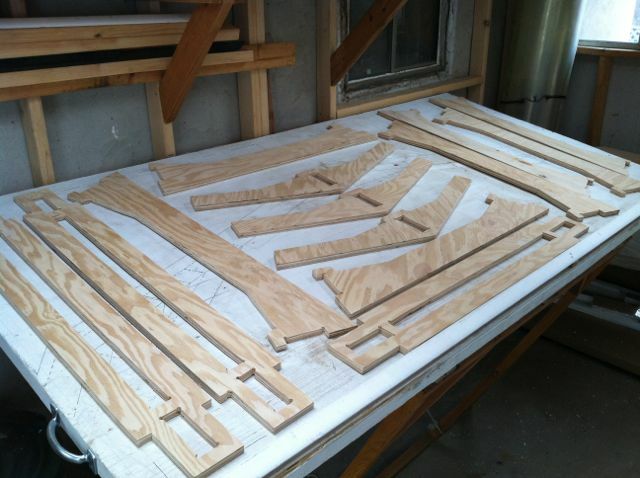 If I get milled components in time to do some finishing work I will be assembling the Entry Arch for show at the Envision Tucson Sustainable Festival on October 18th. 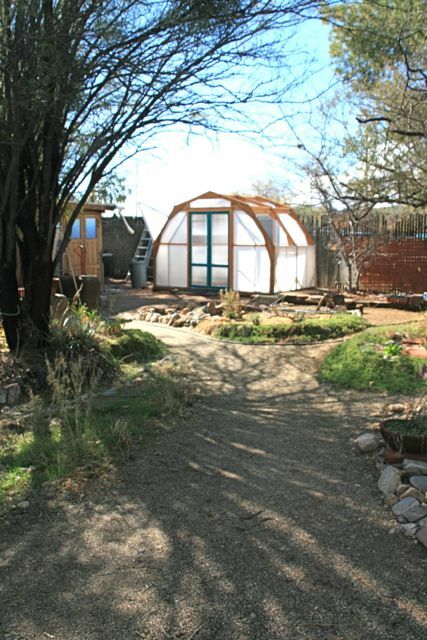 After that I am installing the Full Arch over a hugelkultur bed belonging to Dale and Julie in a midtown home in Tucson. See images below. Five prototype versions of the Nurse Tree Arch exist thanks to the many contributions made to the Nurse Tree Arch Project. You can support this citizen research and development through your donation of mind, muscle and/or money. Money helps the project procure the materials that go into developing and testing a prototype. More than $5000 in contributions made it possible to build the prototypes currently in testing. Click on the DONATE button on this page to make your contribution. Mind contributes to the design process, by providing new ideas and feedback on existing prototypes, publications, marketing, and promotional opportunities. Muscle contributes skill and knowledge to the assembly and testing of each prototype. In the last two years, about 30 Friends of the Nurse Tree Arch contributed Mind and Muscle helping with arch-raisings, staffing the arch at festivals, digging, mixing, sanding and advising. 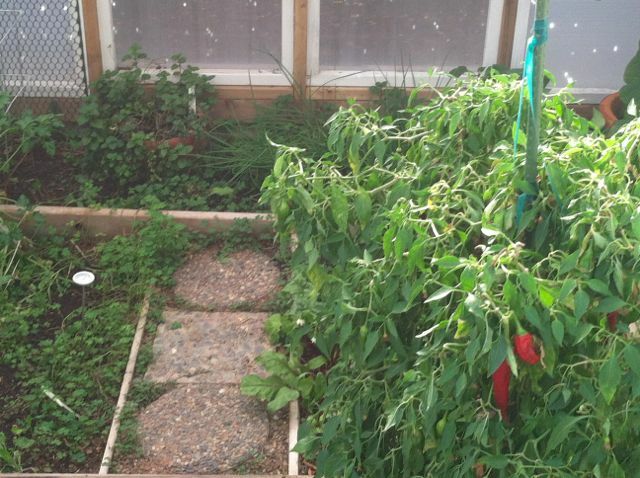 Many more are providing the support and context for dealing with the impacts of a warming planet on the culture of gardening. The Nurse Tree Arch is truly a product of community. To contribute Mind and/or Muscle, contact Michael Ray at mray@dakotacom.net. I’m beginning to make a transition from the old www.nursetreearch.com blog to this WordPress business site for Nurse Tree Arch Design, L3C. This will be a quick update on the progress since June 2014. 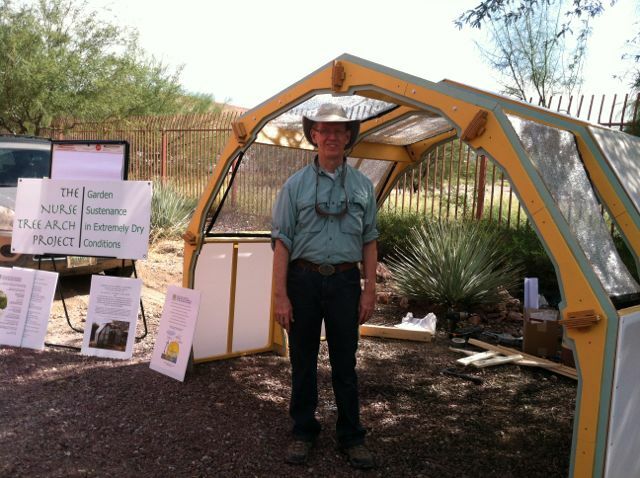 September – October – November 2014: The first manufactured version of the Patio Arch was cut on a computer controlled router at CNCRoutingAZ, a Chandler Arizona firm owned by Gary French. 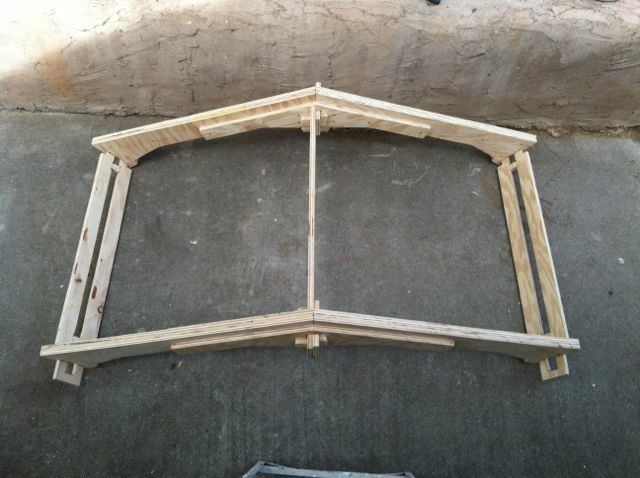 This arch was assembled in the Tucson Workshop of Nurse Tree Arch Design, L3C owner Michael Ray. 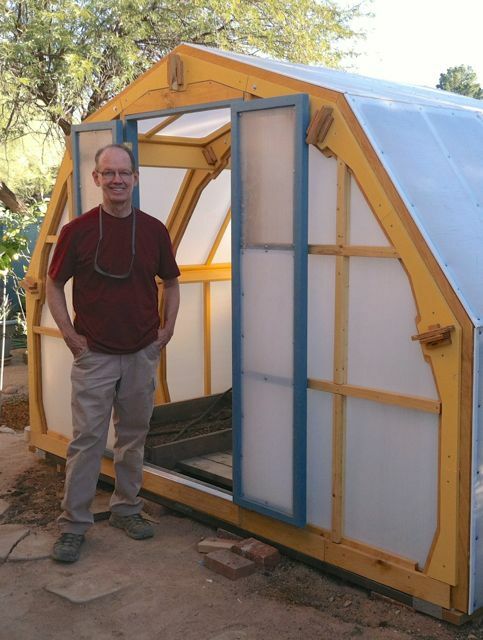 It was shown at the Envision Tucson Sustainable festival October 26th, and then sold to Barbara W. – a local Nurse Tree Arch supporter and installed at her home November 21st, 2014. December 2014 – March 2015: The second manufacturing run – a full size arch for the Fifth Prototype, was cut by CNCRoutingAz on December 19th. After the holidays, work on the foundations for the raised-bed within a bermed wall began. This involved learning to mix and pour earthcrete, and incorporating ferrocement walls within the structure. Finish sanding, sealing and assembling of the components is occuring in parallel with the foundation and wall building work. A new do-it-yourself crowdfunding approach using WordPress add-ons is under consideration. 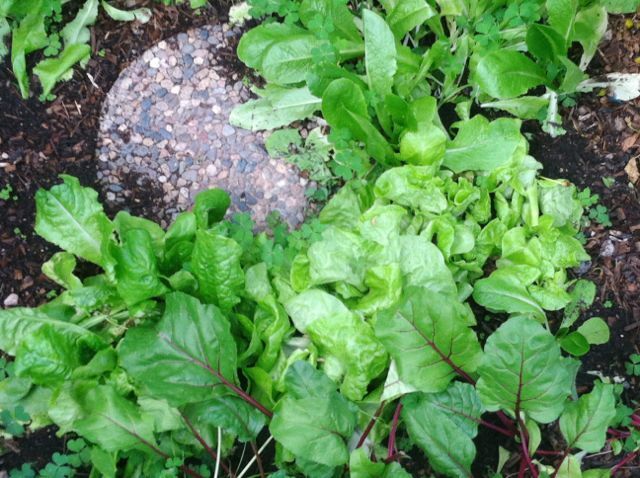 Inside the original Nurse Tree Arch, lettuce, beets, Hatch chilis and kale are feeding the house. 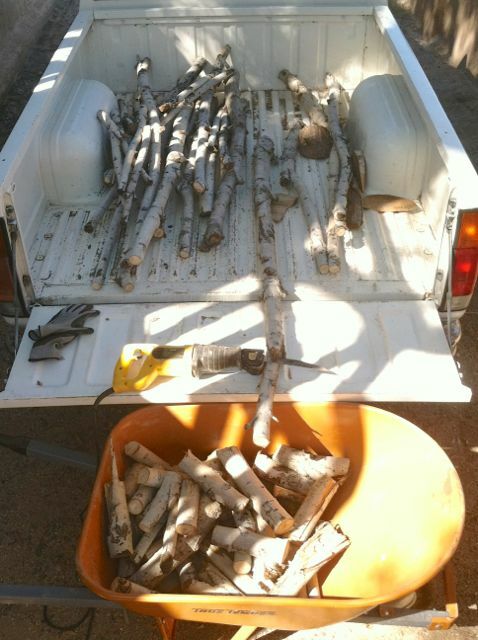 Cottonwood branches are cut for the hugelkultur medium that will comprise the core of the beds. Acacia admires tomatoes and sunflowers in raised bed arch. The deck is new, and waiting for railing to help keep deer and javalina away. Scott desired a way to lift the Aluminet screen so that he could reach the raised beds from outside. 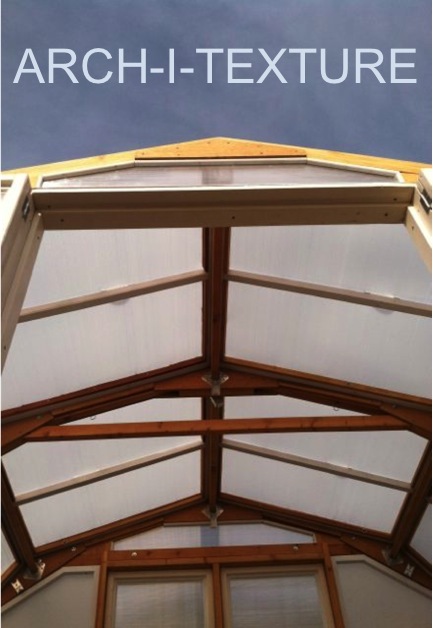 The result was another innovation for the Nurse Tree Arch – Aluminet Awnings! The campaign started April 27th and will stay live until May 28. $950 toward the $6000 goal was raised in the first three days of the campaign! 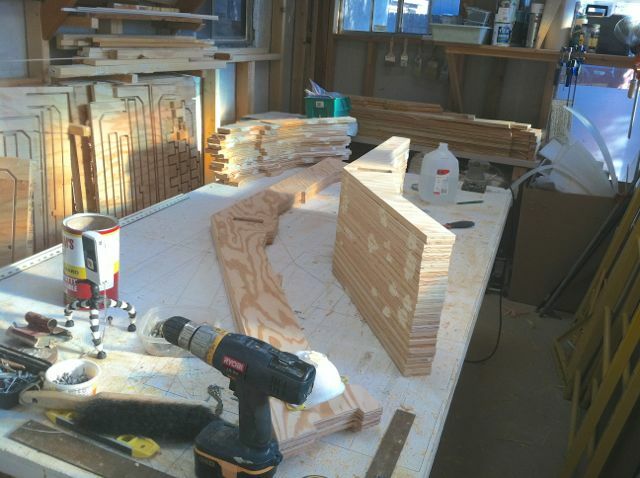 The campaign funds construction of a 4th prototype using CNC routing to fabricate planks and purlins that clip together to create the arch structure. 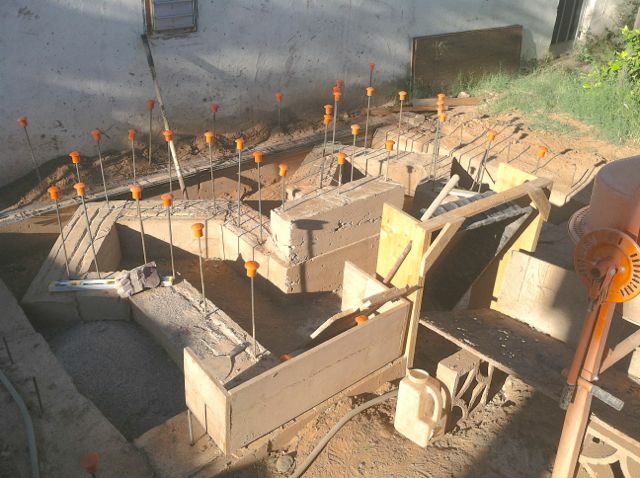 This prototype will also pilot the use of earthcrete sidewalls and a less expensive subterranean heating and cooling system. 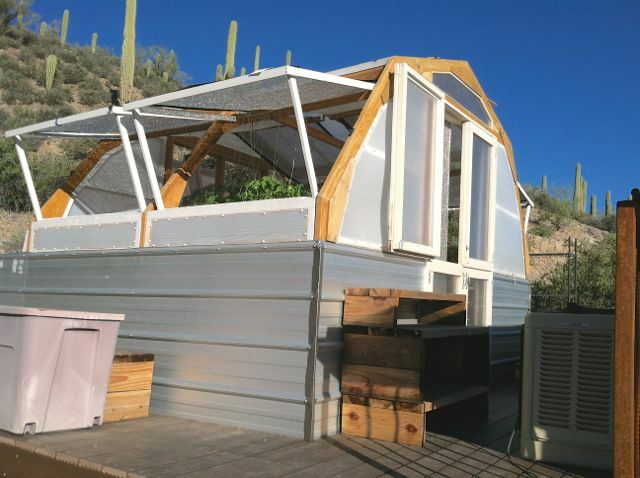 It will also fund the creation of the owners guide to assembly and management of this unique gardening structure. Nurse Tree Arch Design, L3C is excited to work with Kristen Bury, the Community Outreach Officer for Drachman Montessori Elementary School in the Tucson Unified School District. A presentation of initial plans for placement of several Arch structures in the school courtyard was made recently. The school council will meet within a month to decide the status of the project. Kristen is lining up grant money to build the arches, which will be made with the new manufacturing process. 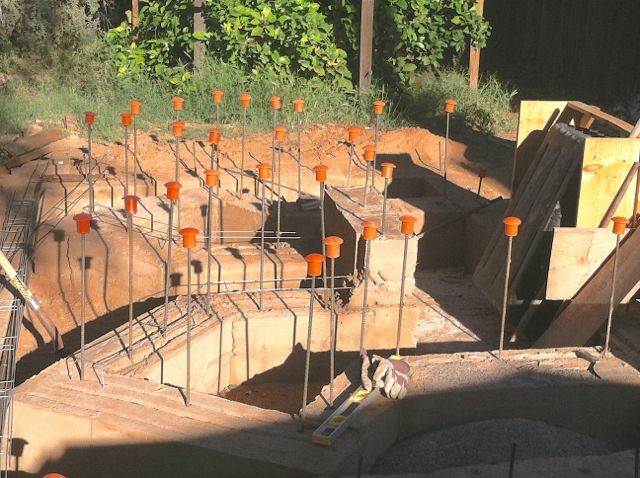 The Nurse Tree Arches will provide a supportive infrastructure for the schools ecology program. Readers of the www.nursetreearch.com project blog know why I think the Nurse Tree Arch is important. If gardening is to survive as a vocation on the new planet we are crafting, it will need to control evaporation and transpiration. Keep the writhing mass of organisms we describe as soil at a temperature below 85 degrees in the summer and above 60 degrees in the winter. Happy soil organisms equals productive plants. The structural solutions offered by the Nurse Tree Arch help make this happen. I chose to organize as a low-profit, limited liability business. This type of business entity attracts investors who share the values of the enterprise. By reducing the focus on profit taking, the L3C form of organization is explicit with investors that the path forward involves maximizing investment in the service of its social progress goals, rather than making investor wealth building the center of the universe. At the same time, investors can help assure that the investments are smart and productive. Arizona lacks the legislation needed to get that form of organization. That is why the Nurse Tree Arch Design is organized through the State of Vermont. 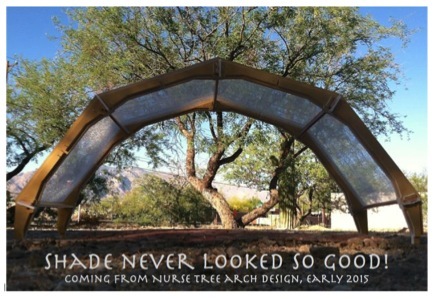 As an innovator amidst a groundswell of interest in sustainable food supplies, Nurse Tree Arch Design is destined to face many moments of truth. My job as the inventor and business owner is to move through the business making process with integrity as I organize a way from early adoption to mass acceptance of sustainable gardening methods, structures and tools. I hope the L3C will attract investment from foundations and individual supporters. The answer to FAQ #1: The plan is to have all systems (business plan, production, quality control, market plan, sales and assessment) working together to serve customers by early in 2015. It is helpful to know that we have willing customers – contact Michael Ray at mray@dakotacom.net . 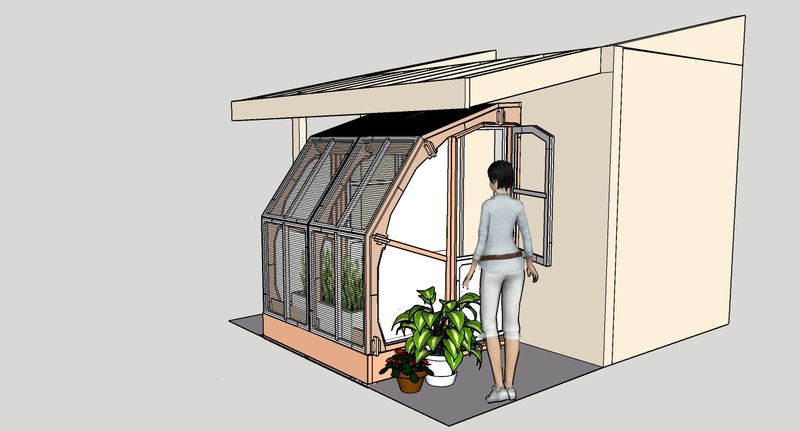 Are you interested in supporting this Nurse Tree Arch enterprise? In the month ahead you will have at least three ways to help this business grow. 1) When prompted by email later this month, go to the Nurse Tree Arch crowdfunding site (To Be Announced on the http://www..nursetreearch.com website soon) and make a pledge of support to the construction of the 4th prototype. 2) Contact Michael about becoming a sustaining investor. Investment can help build a workplace, improve the production process, and expand sales reach. 3) Contact Michael about help needed to staff the April 19th Earth Day booth, or offer other skills and contacts that can help move the project to its full potential. 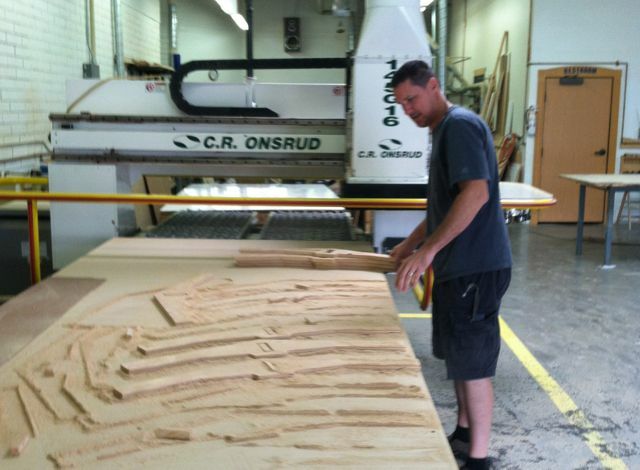 Photo’s below: components of the CNC routing methodology being explored to manufacture the arch.